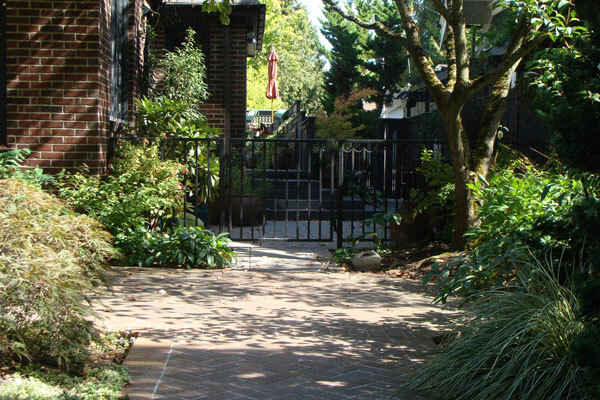 Located near the Seattle Yacht Club, this garden for a graceful brick Tudor home maximizes the usability of every square foot of available space. 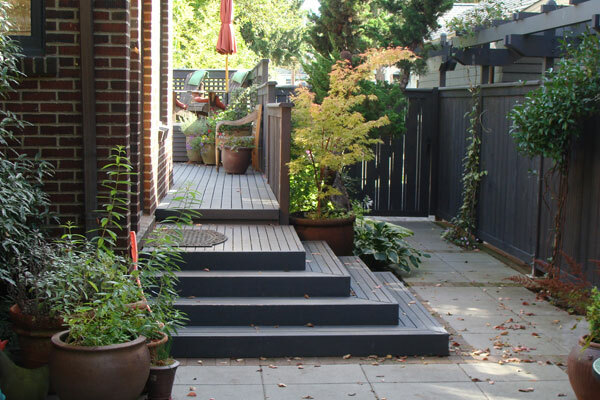 The small back yard, facing an alley, was effectively cut in two by a steeply sloping driveway leading to a basement garage that had been reclaimed for interior space, so Seattle Landscape Architect Brooks Kolb proposed building a raised deck over the driveway to double the available outdoor living space. Demolition costs for the driveway and associated retaining walls were avoided by simply spanning the deck across them. While this rather small urban lot has only a tiny front garden, the north and south side yards were both sufficiently large to be renovated for additional usable outdoor space. 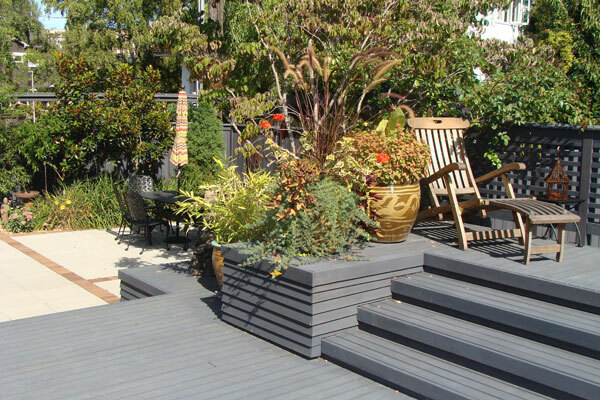 Working closely with the client, Brooks removed a series of wooden raised beds that cramped the north side garden, and added a seating terrace on the south side of the house, connecting to the kitchen door. 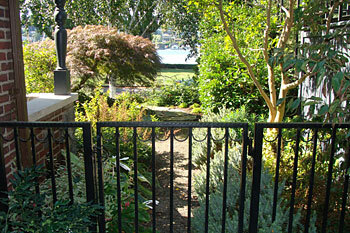 Low ornamental iron fences and gates were installed to separate the front garden from the private back and side gardens as well as to keep a large dog in. Tall, sturdy wood fences with vine arbors were placed on the back and side property lines for added privacy from the neighboring houses and alley. 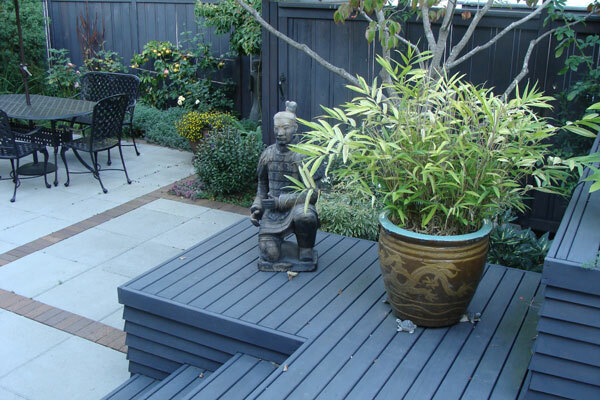 The decks and fences were stained a dark blue teal color, matching the house window trim, and this unusual, dark coloration adds greatly to the elegant appeal of the garden. 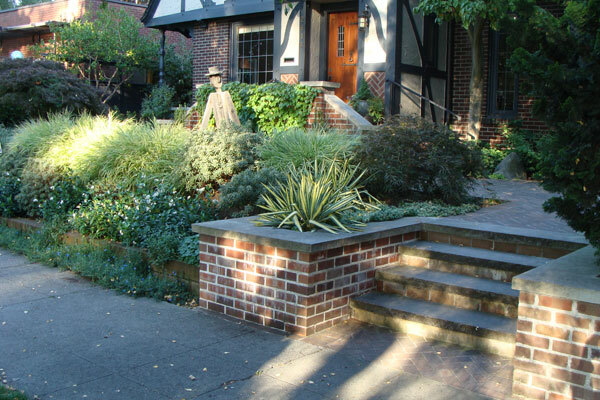 Since the front garden was already graced with a beautiful brick porch flanked by a double stair leading down both to the north and south, only the masonry caps needed to be improved. 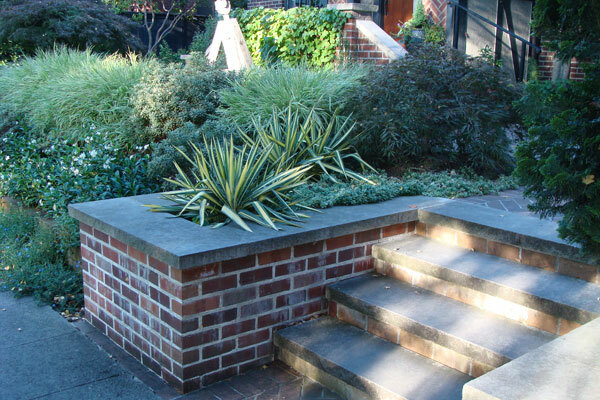 Brooks designed a new brick stair and piers with Wilkeson sandstone caps leading from the sidewalk up to an octagonal-shaped brick outdoor foyer. 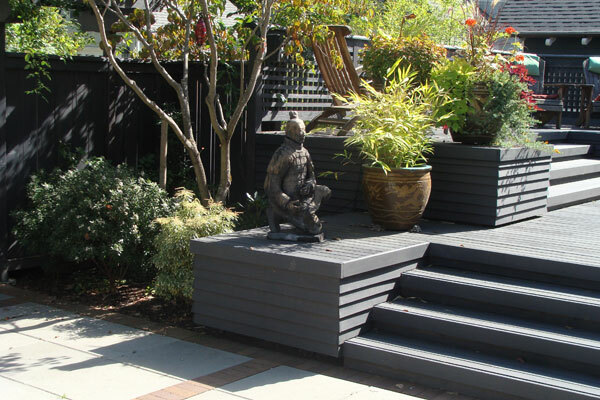 The entire garden provides a rich background for the client’s quirky, but carefully selected sculptures and planters. 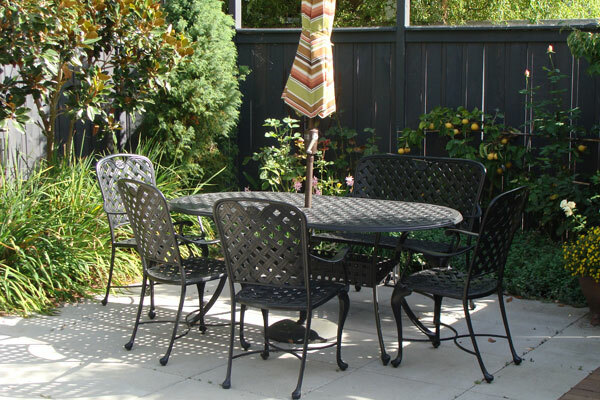 Given the client’s enthusiasm for blooming plants, many rather unusual vines and low shrubs were installed to give the design added pizzazz. To add light and brightness to the narrow north side garden, Brunnera macrophylla Hadspen Cream’ was introduced as the primary ground cover. 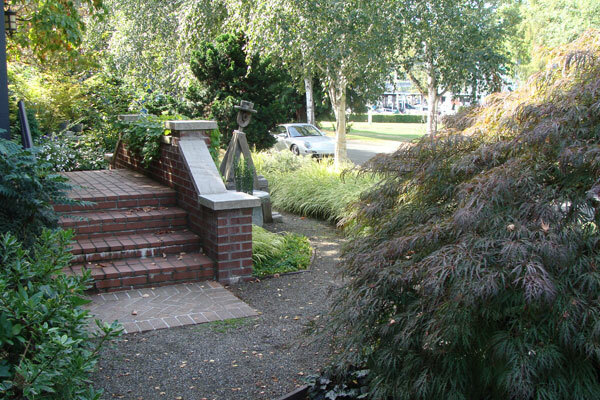 Front garden paths were carefully worked out around a beautiful specimen Red Weeping Japanese Maple. 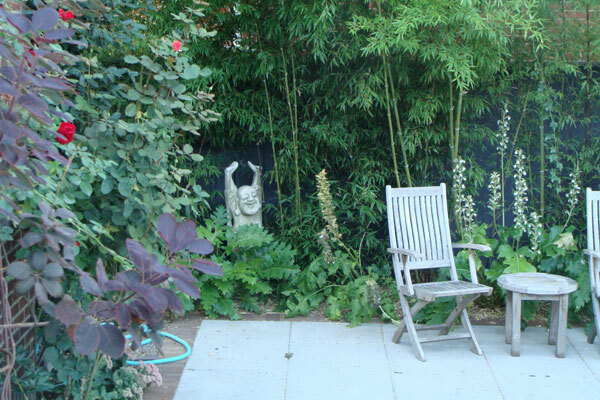 In the back garden, a tall stand of Black Bamboo (Phyllostachys nigra) provides privacy screening as well as grace and delicacy. A trash and recycle cove was integrated into an arbor-topped gateway from the alley. The abandoned driveway is mostly concealed by a new raised kitchen garden and a single parking space off the alley replaces the garage.